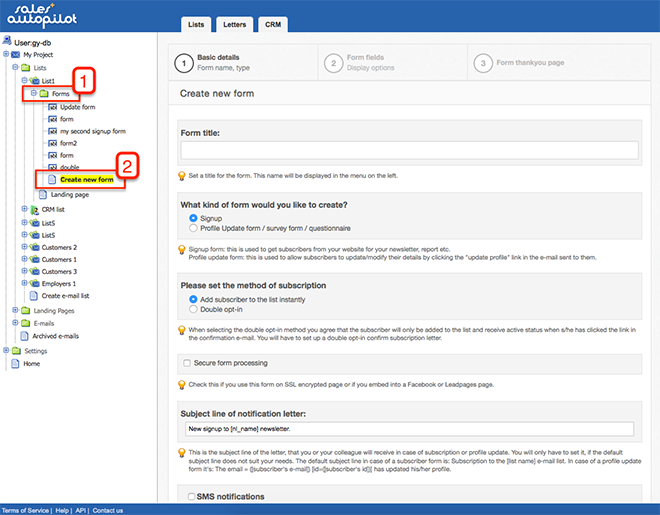 Creating an order form is very similar to creating a signup form, but there are some major additional options. You have to assign one or more products to the order form from the inventory. If you setup integration with an online invoicing system you can set automatic invoicing when and order takes place. Keep in mind that the name of the form helps you identify it later. The type of the form can be order form or update form. With the order form you can gather orders from your webpage. An update form helps you gather feedback about a specific order for example. The Type of order can be double opt-in; use this if you want your customer to confirm from the order. 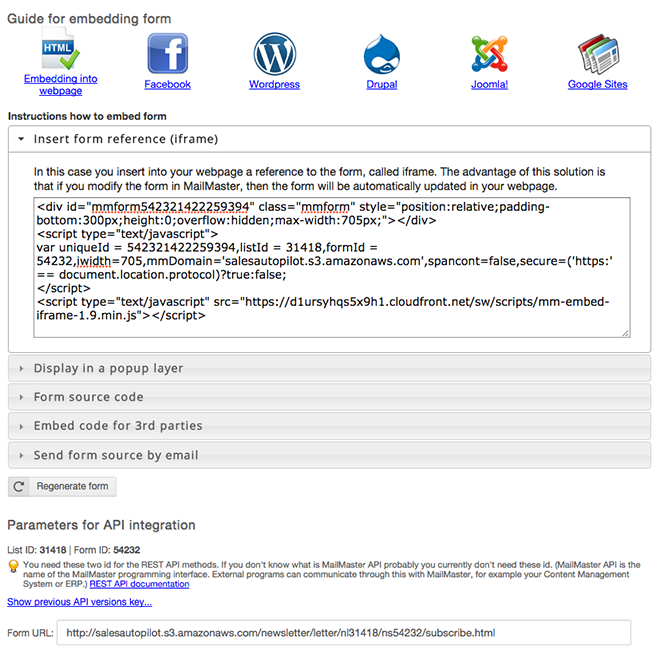 Under the "How would you like the form to be displayed" option you can choose whether you want to embed the form into a specific webpage or you want to use it as a new standalone page. If you have setup an own subdomain earlier you can select the processing and thank-you page domain under "Thank-you page domain". The payment deadline is automatically calculated based on the value you've given. The fulfillment date can be the order date, a given day, the payment deadline or the invoice clearing date. Select the one that fits you. One product order form: the order form handles one single product. Customers can not select any other product. Multiple product order form-,order one product only : Customers can select one product from the selection using radio buttons. Multiple product order form,-order one from every product: Customers can select one or more products using checkboxes. Multiple product order form,- multiple orders from every product: Customers can set the number of products they wish to order. You can assign one or more Shipping and payment methods to the order form. You can select shipping and payment methods to use the same currency as the order list. If you select more than one customers can choose the one they like using radio buttons. If you setup integration with an online invoicing system you can set automatic invoice creation. You can define the invoice parameters by payment methods, so you could setup different type of bills based on the selected payment method. In the Subject line of the notification letters you can setup custom subject lines if you want. If you want extra SMS notifications about the order check the option. 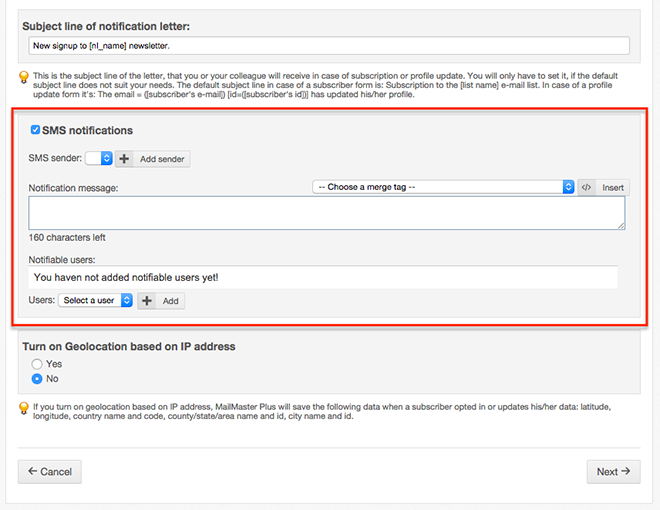 You can select users you want to send SMS notifications to. In the body of the message you can use embedded codes as well. When you finished settings click the "Next" button. On the next screen you can define the products that can be ordered through the form. If you've set one product order form at the previous step, you can assign the one product here. If you've set a multiple product order form, you can assign as many products to the form as you wish. Select the product from the dropdown list and click "Add product to the form"button. If you want to delete a product from the form click the trashcan icon next to the product. If you want to edit how the product name shows up on the form or add more detail like a photo of the product, etc. click the edit button. You can copy your own HTML source code, but first turn on the HTML editor and then edit the description. Click the "Save" link when you finished editing of the given product. At the Price display mode you can define whether you want to display net prices plus VAT or the gross prices. Select the appropriate settings based on your country's financial regulations. 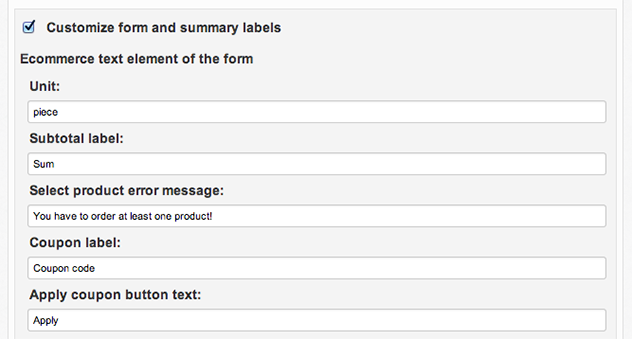 If you want to customize the labels of the order form check the "Customize form and summary labels" option. You can rewrite the labels' default text and use your own text. When you finished assigning products to the form click the "Next" button. 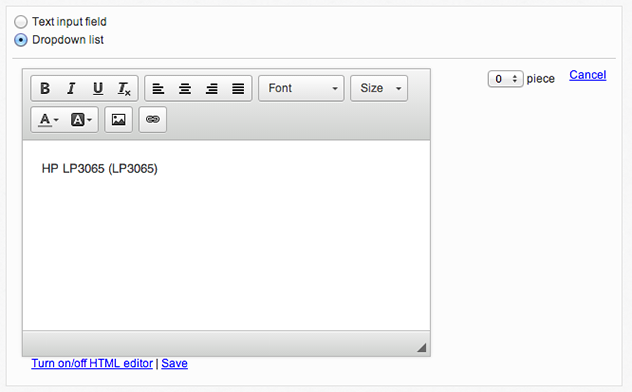 On the next screen you can add fields to the form (email address, firstname, lastname, etc.) This step is similar to the signup form's add fields screen. You have the same options to define the appearance of the form as well. When you finished this step click to the "Next" button. On this screen you can define the content of the "thank you" page. If you assign a credit card payment option you can define the content of the card payment error page. If you use Google Analytics click Yes at the Turn on Google Analytics Ecommerce tracking and copy your Google Analytics ID (similar to this: UA-12345-2). The Analytics eCommerce codes will be placed on your thankyou page automatically by SalesAutopilot, and it will also forward the details of the orders to Analytics. When you finished the setup click the "Next" button. The necessary code for embedding will be displayed. Follow the instructions and you can use the form immediately.